If you’ve ever tried researching artist or writing residency programs as a new parent, then you know your options are limited once there's a baby on the scene. Most programs are only set up to support single artists working alone, and many explicitly state that partners or children are not welcome. There are exceptions (see the Residency section of our Resources Page), but for the most part residency programs are off-limits to nursing mothers, single parents, and anyone unable or unwilling to leave their family behind while they work. At first her idea was met with some resistance, including understandable concerns about privacy and overall noise level. Like most residency programs, the facilities at the SFAI were originally designed to support single artists. The living spaces are dorm-like, with individual rooms for sleeping combined with larger communal living spaces that encourage community sharing and exchange. Noise travels throughout the building. Katie suggested they host all family residencies during a single month, allowing families to take over multiple bedrooms as needed and minimizing conflict with single artists expecting a quieter experience. to include artists who happen to also be parents. Katie Avery leaves the SFAI this Fall to pursue graduate studies in film directing, but feels hopeful that the family residency initiative will continue to thrive under the leadership of the SFAI’s new Executive Director, who is enthusiastic about the program. * Our Resources Page includes a growing list of residencies that allow partners and children. 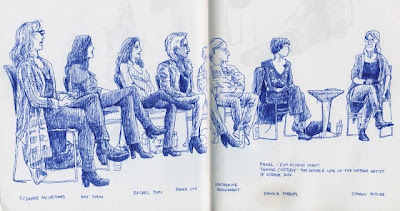 In 2012 the School of Visual Arts hosted a panel discussion entitled "Taking Custody: The Double Life of the Artist Mother." Organized by Cathleen Cueto and moderated by Sharon L. Butler, the panel included six artists at various stages of motherhood Suzanne McClelland, Katherine Bernhardt, Rachel Papo, Amy Stein, Renée Cox, and Danica Phelps. Thanks to SVA, you can watch the entire conversation on Vimeo. At an hour and a half long, it's well worth listening to in the studio or watching after the kids are tucked away in bed. This conversation is just one of many public discussions on the topic, including an upcoming panel scheduled for the College Art Association Conference this Spring. You can find Sharon Butler's introduction and the questions she posed on Two Coats of Paint, right HERE. What would your own responses to these questions be? What questions still need to be asked? Alberto Aguilar’s practice merges his various life roles in an attempt to capture fleeting moments, personal discoveries, and his interaction with others using whatever medium is at hand. As the father of four kids, family often plays a major role in this exploration, whether it’s through the invention of musical living-room sports, sculptural reconfigurations of household objects, or a collaborative performance with his daughter’s class at school. In the face of an art world that generally dismisses the presence of children, Aguilar enthusiastically includes them as active participants in his work. HomeFieldPlay, a series of Alberto’s multilayered interactive installations, is on view at Chicago’s Museum of Contemporary Art through October, 2013 -- a great show to check out with your own kids along -- and he has new projects in the works for galleries in Chicago, Kansas City, and Boston in the coming months. We caught up with him to ask about the intersections between his work as an artist and his life as a parent. CR: Briefly describe your kids in your own words. Alberto: Joaquin, 9: He is moody and attached to his mother. Being the youngest, he fights for his rights. He asks for things over and over again (which was my technique for getting things as a kid). He has been trying to get me to give him the real axe in the garage for a long time. I finally broke down and said he can have it at the first sign of an apocalypse. Paolo, 10: He is protective of all of us. If we have to go outside at night for something he comes with or watches through the window. He regularly naps in the car making him an early bird and a night owl always ready to make stuff. He has a fascination with miniature things. He likes money and always thinks of ways to get it from his handmade creations. Isabella, 11: She is my princess. My sons claim that she never gets in trouble. She is intense, sometimes she talks by herself making up different voices. I guess it’s called acting. I used to pretend not to see it because she would get embarrassed and stop doing it if I brought attention to it. Now I sometimes join in and together we become other people and go to new places. She also sings beautifully and has a current obsession with learning new languages. Madeleine, 15: People say she is the most like me. I agree to some extent - but she is the nicer, more considerate version of me. She over-thinks things, she draws, she sews clothes, she makes weapons, she loves soup, she makes music and plays any instrument at hand. Whenever she records her music she does not do it in a silent place but prefers being in the midst of things, including all the noises of our daily home life. Currently she is working on an album about Joan of Arc, whom she greatly admires. She is very aware that she is destined for great things and accepts whatever pain may come with it. CR: At what point did you begin incorporating your children into your work, and what are some of the ways it has it affected your practice? Alberto: It began in obvious ways, like drawing with them, because you know how great and inspiring children’s drawings are. But then I started to become interested in their daily ways of being -- like the intensity with which they watch TV. First I started drawing them in the act of watching. Now I take pictures of them looking at this unseen source with the kind of sincere commitment that I desire to look at things with. Another way that my children affected my practice was through music. I would always make up these dumb songs with them. At a certain point I realized that there was something of value to these songs, so I started to record them on a cassette recorder whenever they came about. After I had collected a bunch of them I noticed that each one marked a particular moment and that as a whole they carried some poignant universal truth about being human. Parenting has affected my work by making me a more aware looker and a better listener to things we might normally disregard, things that take place in the between times. CR: How do the members of your family feel about being part of the work? Does it just seem normal to them, or is there ever any rebellion? Alberto: Never rebellion. When I started to use Madeleine’s music skills as part of my work she would get frustrated. She had the skills, and I understood structure and had endurance for long hours of hard work. Sometimes I pushed her to edge and she would break down crying and confused. As a result she learned discipline, structure and gained endurance which she still uses to this day. I learned a little bit about music and I became more aware of the potency and potential of the creative mind of a child. I also became more sensitive of how far you can push a child and the importance of encouraging them on the way. If anything, they get embarrassed. I can barely get my wife to do anything in front of a camera or a mic, and Isabella is just now starting to get comfortable with it. There was a long time that I ignored her creative acts in order to build up her confidence. My youngest son was angry and cried one time because I made a Christmas Pageant video with him in his underwear and put it online. In the end they look back and realize the importance of what we did in capturing a particular moment and our time becomes legendary to them. My main thing is keeping things natural and real, so I kind of know how not to bring attention to the fact that I am recording. At this point it is a normal occurrence that I will drop everything and start recording, so they naturally ignore whatever camera or device I use. CR: Your work often documents objects or events in the intimate, comfortable spaces of home. What has it been like to bring these to the context of a museum? Alberto: When I started I could not imagine that this kind of work would ever be shown at a museum, so it comes as a surprise and it feels great. These are the things that have always been missing in art museums for me. In teaching art appreciation for so long to non-art-majors I was very aware of the division between contemporary art and the general public. I realized through my students that it is sometimes hard for them to relate to art with all of its inside art languages. Everyone can relate to “home,” because everyone has lived in one at some point in their life, and everyone desires certain aspects of home. What I did at the MCA is not all about making visually stunning objects, but rather creating situations that people can relate to, and bringing these objects and situations to a new light. Making people aware of how exciting everyday life can be and making the art museum more accessible. Alberto: In 2001-02 I saw a video on Gabriel Orozco that started to change the way I thought about my home life. In it he spoke of the separation and conflict that exists between studio time/leisure time/work time and how he reconciled them by ridding himself of the studio, by not being a specialist in any particular medium and by making work wherever he is, even while taking walks. It all made perfect sense to me. I showed that video to my art appreciation classes over and over again until it began to set into my own life. It prompted me to let go of the traditional idea of studio and to think about integrating my various roles in life in order to make them work in harmony. Sometimes I would show videos in class that I’d never seen before in order to learn about new artists. Between 2004-06 I happened on a video about Mierle Ukeles, which I initially resisted because It had the word feminism in its description. After running out of new things to show in class I decided to screen it. It resonated with me immediately. She talked about how after having a child she no longer had time to spend in the studio, and then one day as she was changing her baby’s diaper she realized that this act could be art simply by designating it as that. I took up that call by considering my parenting, my teaching and my daily house chores my art as well. I had just bought a fancy digital camera so I started to document myself mowing the lawn, cleaning, scrubbing down surfaces, painting the garage and I let go of my studio, which was a shared space with the laundry room. CR: Any strategies or advice that you’d pass on to new parents struggling to maintain a creative practice while raising a family? Alberto: First off, I would not be able to do what I do without the great and amazing wife that I have. I met Sonia when she was 17 and I asked her to marry me because I recognized greatness in her that would compensate for everything that I lacked. In terms of parenting she disciplines the kids and endlessly works towards keeping order. She teaches them to be as she is: good, responsible, considerate citizens of this world. Whereas I teach them about living a balanced life, considering pain a friend and a teacher, trying new things, and how to creatively navigate this world. So I guess the first thing I would advise is to know your roles and engage them fully. my brain, it generates energy and stamina in my body, and I have fun. Since we are physically active with them and teach them to live creatively, we do not have the pressure of putting them in extracurricular activities outside of the home. This saves a lot of money, energy and time. I’m not saying that we never put them in programs -- if there is a good free/cheap program that they can be part of we will send them to it. Then when they come home with new skills, abilities or knowledge, I steal them or incorporate them into my work in some way or another. I see my kids as my arsenal, my army and my legacy, and this helps in not feeling that I am wasting my time or that my time with them is less important than my art production time. They are an investment. In the obvious way that one day one of them may strike it rich and take care of all my outstanding debt…but more importantly, that one day they will use the wisdom and creativity that we shared with them and carry it on in their own work in an even greater way than we could ever imagine. For more on the Aguilar Family, see Part I and Part II of their reports on the 2014 Open Engagement Conference. Irene Pérez is an artist and curator investigating memory, identity, home and housing. Born and raised in Spain, she studied Art History before relocating to the US, where she pursued two art degrees in photography and studio art. 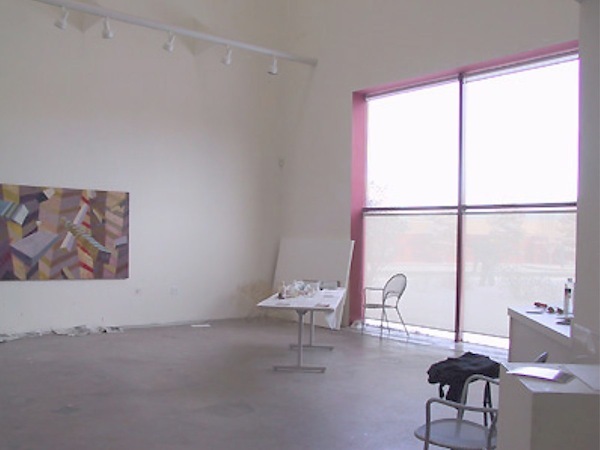 While she was still a student she began organizing ambitious exhibitions and projects, serving on the curatorial team for artXposium and co-founding the Second Bedroom Project Space with fellow artist Christopher John Smith in addition to making and exhibiting her own work. Upon returning to Spain, however, Irene struggled to reconnect to the art community there, especially once her daughter was born. After a lot of hard work, this year has been a good one: she has already had two solo exhibitions in 2013 and is looking forward to several upcoming group shows and artist residencies. Her interview is a candid reflection on the challenges of balancing motherhood, art, and identity. CR: Tell us a little bit about your daughter: age, name, general temperament? Irene: Maia is a strong, chatty, stubborn, creative, moody, loving and intelligent person whom I’ve been falling in love with for the last three years. She just turned three, so for the last year she has been going through her “twos” phase (let me tell you they don’t call them terrible for nothing) which turned her into a very temperamental little girl. But just three weeks into her “threes” I can see some changes happening and she is becoming more communicative and less irritable. 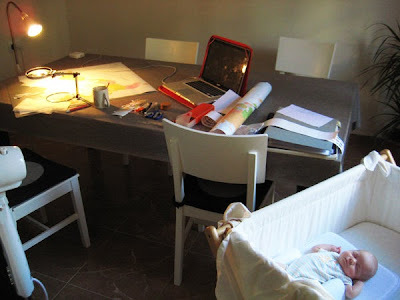 CR: How do you find a balance between parenthood, artmaking, and a day job? What strategies might you recommend to other artist-parents? Irene: In my experience finding balance is a day-to-day endeavor. Being a mother is a new experience for me, and life with a child changes constantly as they grow up. So, there are both a learning curve and a high degree of instability that become part of your daily life. Since Maia was born, my professional status has changed twice. I was unemployed during my pregnancy and until Maia was 10 months old. I had just returned to Spain and was still trying to get reacquainted with my home country and the art world here. After Maia was born, I was just trying to keep myself together and not collapse from exhaustion. 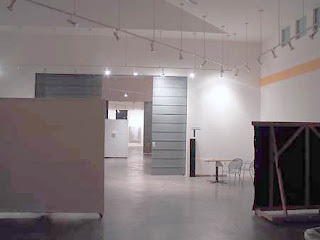 Still, with no studio and a small baby, I kept producing some work and participated in a couple of group shows. The way it worked out was to work during Maia’s naps, sometimes even with Maia in my lap, and then during the few hours Maia’s dad could look after her. When Maia was 10 months old I got a full-time job. I worked at this company for a year and a half, Monday through Friday. Between the commute and my working schedule, I ended up only being able to see Maia for about 1 hour each day. I used Sundays to work in my studio for 5-6 hours every week. That was a nightmare -- both because I couldn’t spend time with my daughter and because I didn’t have worthy time making art (I am a slow producer). Fortunately, I had the option to quit, and I am now an (almost) full time mom/artist, doing work a few times a month as an exhibition guide and doing art workshops. Maia now goes to preschool, so I drop her off in the morning and most weekdays I go to my studio during the hours she is there. I do have to say that I have family, my parents-in-law especially, who help us out. Sometimes when I am preparing for a show, they take care of Maia after school. My husband and I have also, little by little, been working out a system. He is a research scientist and his job is very demanding, time consuming and he travels often. We take turns picking up Maia after school and taking her to the playground or the library. It does take a village, not only to raise a child, but so that her parents can have productive lives as well. CR: How did you get back into a studio practice after having a newborn? Any advice to other artist-parents for getting through that phase? Irene: It took me a while to have a full studio practice again. During the first few months I didn’t have a studio and worked at home, which allowed me to have Maia by my side. 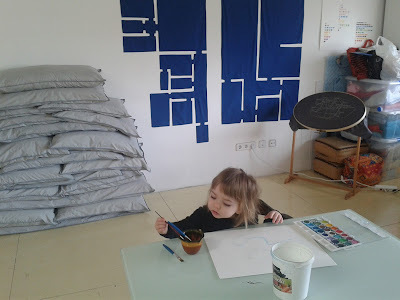 But it wasn’t until Maia started going to preschool that I got a studio space and went back to making art regularly. Up to that moment I mainly kept notes and sketches for works, so when I finally had my studio I had lots of ideas and was very excited to realize them. For the first few months of your child’s life you think and feel often that you will never be able to make art again. I couldn’t see how I would manage two such demanding things together, both of which I wanted to give 100%. All the advice I can give now, seeing things in perspective and only three years into motherhood, is to be patient and don’t give up. Take time to enjoy being with your child, and even take her with you into your studio if possible and safe. CR: How has parenthood affected your creative practice and/or the work itself? Irene: The fact that I am now not only responsible for my daughter’s education but also truly invested in her becoming a fulfilled, honest and happy person has made me realize that I can only help her achieve all that by example. I became a professional artist not that long ago when I graduated at age 33 (I am 38 now), so I had my doubts about being able to pull through since I got here a bit late. This has changed my practice in two ways: one, I do not give up when things do not work out; two, I follow my principles making artwork that I believe in and, if applicable, sharing my ideas and art experience with others. 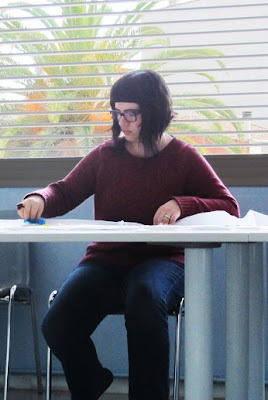 I now volunteer through the Documentation Center and Textile Museum of Terrassa teaching embroidery to psychiatric patients. 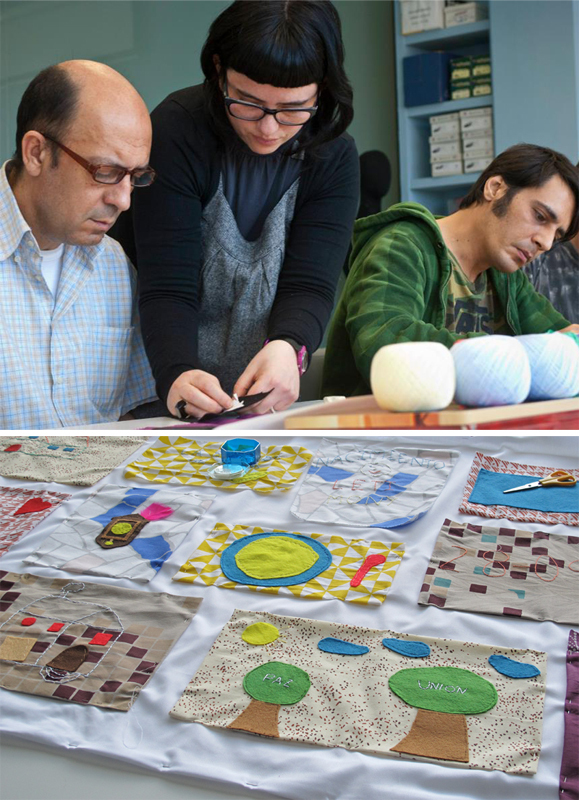 Together, these patients, their therapists and myself have created the Collage of Memories project, made up of embroidered pieces that reproduce specific moments and memories from our past. As for the work itself, I am starting to see a turn more towards social issues that worry me, both because of the alarming situation we are living in Spain (economic but most importantly in relation to the loss of our social rights) and because I fear for my daughter’s future. My recent piece sinHogar (homeLess) was made in reference to the hundreds of thousands of evictions that have taken place and are still taking place in my country, leaving hundreds of thousands of families homeless and without any chance of recovering. In a way my work is also becoming a conversation with my daughter about the things I want to share with her. I hope that as Maia grows older she will take a more active part into my work just because it is an experience I want to share with her. So far, her voice has made it into one of my most recent video pieces. CR: Has having children affected your relationship with the art world? 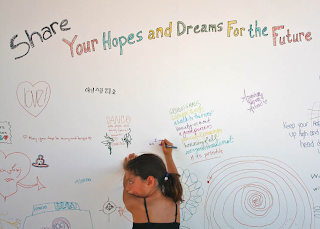 What alternative structures might make the art world more inclusive for artists with families? Irene: Yes and no. When you have a small child, it is difficult to be able to go to openings that usually happen in the evenings, so that cuts down on opportunities to network. Still, I go to exhibitions on my own (less often than before my daughter was born) or with Maia -- something I really like to do because it has become an amazing learning experience for both of us. I network any other way I can, usually through the Internet. It is also harder, economically, logistically and time-wise, to travel for work or go on residencies. You adapt and look for opportunities that you can make work for your situation. As I am writing this, I am at a residency at Nau Côclea, in Camallera, Girona, Spain. I’ll be spending ten days here working on a new project and since this place is only two hours away from where we live, Maia and my husband can come and spend the weekend here with me. Later on this summer, I’ll be in a residency through People Made Visible for three weeks at the West Chicago City Museum. Maia and her dad will accompany me for two weeks while I work, which will be our family vacation this year. CR: Is there anything else you’d like to address that hasn’t been asked? 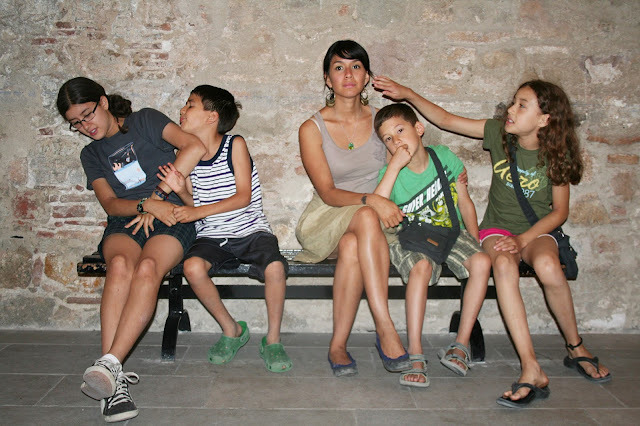 Irene: At a personal level, my experience with motherhood as an institution hasn’t been good. 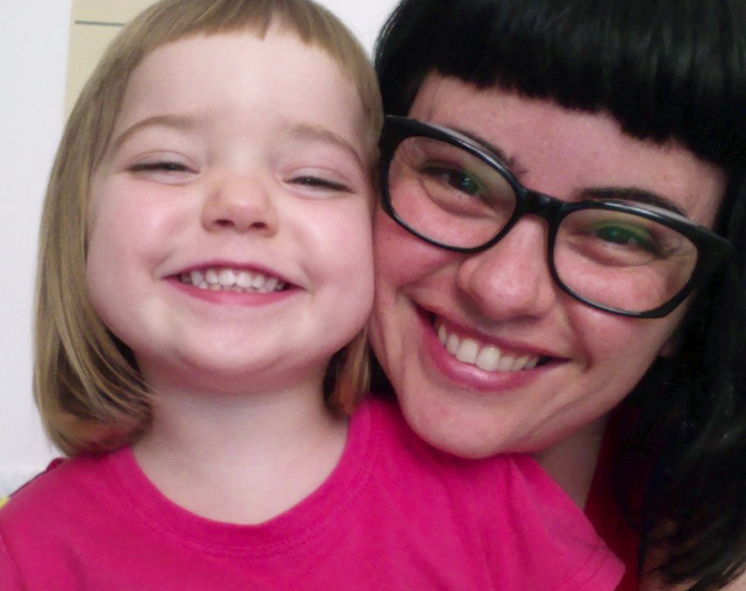 For the first year and a half of Maia’s life I loved my child but was at war with motherhood, because it had taken away everything I had worked for in the previous ten years and made very real some of my insecurities and fears. I also felt motherhood, or should I say the social construct of motherhood (especially here in Spain), took my social “status” and role as a woman back 50 years. Everybody tells you your life is going to change when you have a child, but you really have no clue what they are talking about until you are a parent. It was hard to come to terms with giving up studio time and the complete freedom to decide. It was even harder to see how becoming a mother made me feel that socially I was only valued in relation to giving birth and taking care of my child. What I have come to realize is that, as much as artmaking is my way of making sense of the world, Maia is a crucial part of my life experience. Not being in the studio whenever I need to be is still difficult, but it is equally hard to take away time spent with my daughter for how important it is to both of us. A friend told me jokingly: “Becoming a mom has turned you into a feminist.” But it is not a joke. I thought feminism was a thing from the past, and before having Maia I was naïve enough to think there was no need for women to fight against the social norm since I had never experienced discrimination for being a woman. Now I see I have to be part of a positive change for women. And I have to be part of change most especially for one woman-to-be: my little Maia.